There are very few organizations like AS220 Youth. Sure, there’s lots of teen-focused arts organizations across the country but few have achieved the long-lasting and diverse roster of programming and results that AS220 boasts. AS220, similarly to many orgs use arts to connect and empower youth. Very few organizations, however, go into juvenile prisons to deliver photography education. AS220 does. Very few organisations go into juvenile lock-ups to begin programming in order that they may continue it upon release of the teen with whom they work . AS220 does. AS220 Youth, based in Providence, Rhode Island, gave me the warmest welcome a few years ago. They opened the door so that I could do a workshop with their incarcerated students. I gave a public lecture on my developing ideas about prison imagery. I interviewed the staff and helped students with portfolio reviews. My eyes were open to what a community can be. Not only did the people stay in my thoughts, the work did too. 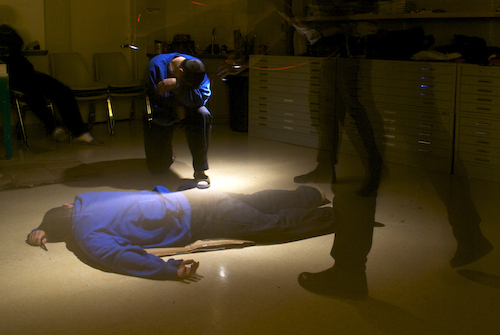 In late 2013, I included light-paintings made by youth incarcerated at the Rhode Island Training School in Seen But Not Heard (Belgrade, Serbia) a photography exhibition about U.S. juvenile detention. If AS220 Youth did not exist we wouldn’t see these views of the world created by kids who are locked up. I’ve written about AS220’s youth programs before. I have noted how rare it is that photo programs are inside juvenile detention facilities. AS220 is doing things no-one else can do, or have the imagination to do. You’ve no reason not to help them out. For the first time in AS220 Youth’s 15-year history, it is conducting a individual giving campaign. They’ve turned to IndieGoGo to push alternative revenue streams having seen public money dry up. AS220 Youth has about half the staff this time last year, and yet it is serving more students than this time last year. Bravo to Lapham, his colleagues and the AS220 students. Help them continue their valuable work: visit the AS220 Youth Futureworlds IndieGoGo page. Check out more about AS220 Youth program Photo Mem. See the students’ portfolios. Above is a video about a public art project AS220 Youth made. Throughout this post are images made by youth incarcerated at the Rhode Island Training School.